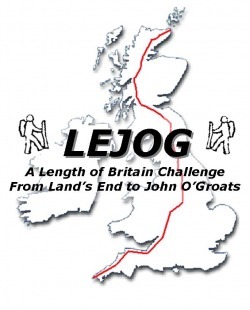 There are many ways to complete the famous Land's End to John O'Groats challenge. However Edward Matts and Carlie Beavan have chosen to walk the route, off main roads, rough camping where possible with no logisitcal support. From this website you can learn more about the route, sponsor them and catch up with them while they walk the length of Britain! This 1000 mile trail will take them from Cornwall through Exmoor, through the Quantocks and on to Chepstow and along the Offa's Dyke Path to Mid Wales, they will then head North on a route between Liverpool and Manchester up towards the Lake District and into Scotland. Once in Scotland they will be walking towards Glasgow and on along the shores of Loch Ness before heading up futher North to the edge of Britain itself! All with minimum main road walking.